August Buermann immigrated to the US from Germany in 1864 and enlisted with the US Army. He fought in the Civil War and afterward returned to Newark, NJ which was a major manufacturing city and worked for Alexander Barclay’s company. Buermann was a great businessman and bought out Barclay and renamed the company Buermann Manufacturing Co in 1866. Over the next 60 years Buermann’s company produced the most complete catalog of bits and spurs of any company in the US, producing as many as 441 spur styles and 496 bit patterns. Many of these styles were original designs which were patented, as well as many other popular designs that were copied from other makers. Buermann also patented a metal alloy he called Hercules Bronze, which was a nonrusting alloy that had a nice bronze appearance (though it is not bronze). In 1926, North and Judd bought the Buermann company, it’s catalog, factory, and logos. North and Judd continued to produce many popular Buermann patterns, especially in Hercules Bronze with the Anchor logo after 1926. The Buermann company was one of the first to mass-produce spurs, although he always maintained a line of hand-forged spurs of high quality. His company produced spurs of all types and styles from Mexican, California, Texas, and even older European and military styles. He is best known for the O.K. 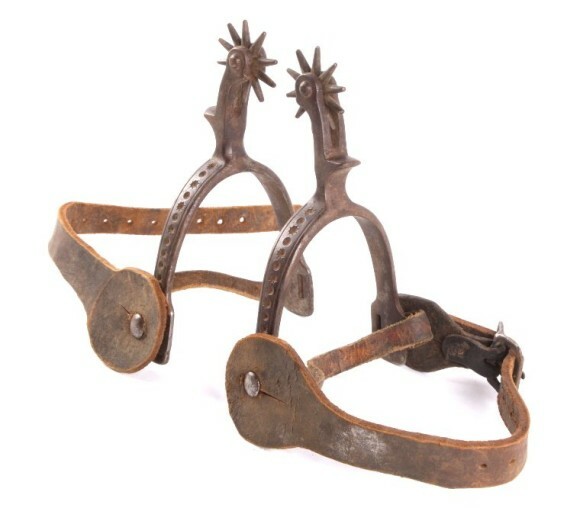 style spur, which was an affordable and durable design popular in the late 1800s. Buermann was adept at keeping pace with the changing styles and tastes of the day and was known to heavily borrow from the designs of other makers whose designs proved popular. He employed people who lived and worked out West to keep him informed of popular styles. In addition to bits and spurs, the Buermann company produced saddle trimmings, stirrups, buckles, conchos, and other decorative items. Click here for information on Buermann Maker’s Marks.